I will admit it before I begin: I do not cycle to university. I, like many other U of M students that live more than four or five kilometres from campus, either bus or carpool to school. It is not that I do not want to grab my obviously super cool and hip-looking fixie bike and ride to class, although I admit that there is some laziness involved in my decision to drive; rather, it is because I do not feel safe commuting by bicycle in this city. Simply put, Winnipeg does not yet have the right mindset or adequate infrastructure for cyclists to ride safely to work, school, or almost anywhere else. Although there have been efforts to increase the allure of cycling in Winnipeg, the city has some serious flaws that have prevented a majority of those efforts from becoming reality. The lack of sufficient bike lanes, unhealthy rhetoric at City Hall, and a proposed mandatory helmet bylaw have made this summer a tense one for current and prospective commuting cyclists. Despite these obstacles, there are ways this city can improve its biking culture just like a number of other cities, many of which share similarities with Winnipeg, already have. Just last year, I had the privilege of spending a semester living and studying in Aarhus, Denmark. I assume you can see where this is going: bicycle culture in the land of the Danes, much like in bike-savvy Holland, is far superior to ours in many ways. Virtually every street has a separated bike lane on each side of the road that is clearly marked and securely divided from the sidewalk. As well, the Danes have installed separate, smaller, traffic signals at each intersection solely for cyclists. The Danes have also made right-hand turns on red lights illegal for motor traffic for fear that a cyclist may get hit. In fact, respect for fellow commuters on bicycles is so ingrained in Danish culture that collisions between drivers and cyclists almost never occur. When explaining this incredible system to Winnipeggers, I usually receive a little scoff and some sort of short explanation as to why that could never work here. Today I pose the question in return: why not? Montréal, a city much closer to home and about twice the size of Winnipeg, has also shown in recent years that major urban centres must focus on improving cycling culture. The city has recently introduced BIXI bikes, which are for-rent bicycles placed on racks throughout the city that are available for $5 a day. 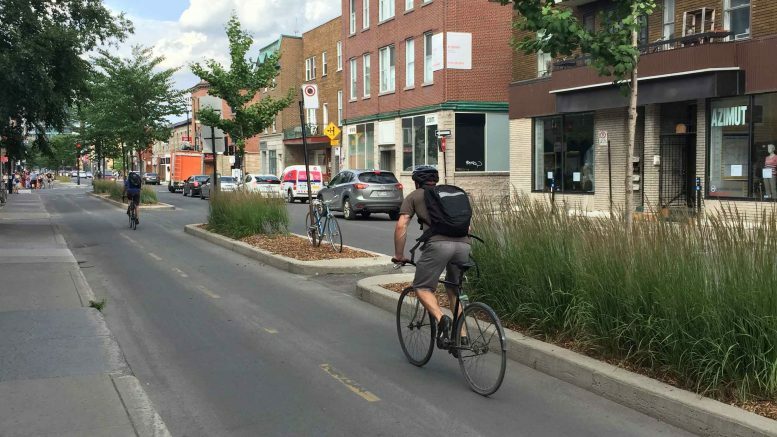 Montréal has also significantly expanded its number of separated bike lanes and the province of Québec recently passed a law requiring a one-metre buffer zone between motorists and cyclists. These changes were not easily won for Montréal, nor will they come easily for Winnipeg. City Hall, not surprisingly, has dragged its feet on this issue for years. Not only have councilors stalled introducing plans for better and safer cycling routes, but some city councillors have even outright antagonized proposed improvements to our bike culture as well. One such councillor, Russ Wyatt of Transcona, has been an avid supporter of a proposed bylaw that would enforce all cyclists to wear helmets. To some, this sounds like a variation on seatbelt laws in cars and as such, would be completely acceptable. In reality, however, this proposed bylaw is a veiled attack on commuting cyclists and an excuse for city hall to continue evading the prospect of providing safer bike lanes for Winnipeggers. By propagating this bylaw, city councilors like Wyatt are attempting to shift the blame for the number of cyclist injuries and fatalities. Lawmakers are trying to condemn cyclists for the results of the dangerous situations they find themselves in, rather than face the reality that cyclists are being injured or killed in incidents that could be prevented. This is a dangerous sentiment to hold. On July 8, Leslie Freudenberg was cycling down Hamilton Avenue at 2:40 p.m. when he was struck by a construction vehicle. He was pronounced dead at the scene. On July 20, a woman was hit by a semi on her bike at the intersection of Main Street and Logan Avenue. She died soon after. There are no separated or painted bike lanes at Main and Logan. In April, Casey Donaldson, a local musician and father of two, was cycling on Nairn with a friend when a drunk driver hit him in the curb lane, then drove away without stopping. Donaldson died of his injuries. Nairn Avenue is a major thoroughfare in Winnipeg. It has no bike lanes. Lawmakers at City Hall and our community as a whole must work harder to make this city a bike-friendly one. Fortunately, plans for new bike lanes on major streets downtown are currently being reviewed and attitudes are shifting toward a more progressive stance on bike culture at the grassroots level. For now though, I may just stick to getting to school by car. To those who brave the narrow lanes and fast moving traffic early on frosty mornings, I applaud and support you. Our city has a long way to go until its bike lanes are up to Denmark’s, or even Montréal’s, quality and there are some serious hurdles in our path, but if cyclists in this city know one thing, it’s how to weave around obstacles.